Today in the Vault: Two New York tributes to the dearly departed Beatle. Did you know that Paste owns the world’s largest collection of live music recordings? It’s true! And what’s even crazier, it’s all free—hundreds of thousands of exclusive songs, concerts and videos that you can listen to and watch right here at Paste.com, from Louis Armstrong to The Who to U2 to Wilco. Every day, we’ll dig through the archive to find the coolest recording we have from that date in history. Search and enjoy! In 1985, Central Park added a new attraction to its grounds. Strawberry Fields, a quiet space meant to engender peace and meditation, was consecrated as a memorial for the late John Lennon, who had been shot by a deranged fan outside his New York apartment building just across the street five years earlier. With the help of widow Yoko Ono, Strawberry Fields remains a popular destination and place of remembrance for Beatles fans at the corner of Central Park West and 72nd Street. Even before his death, Lennon was an important component of the park’s identity. In the late summer of 1980, Elton John held a free concert on the grounds, drawing an astonishing crowd of over 400,000 people—mostly because of Elton John, but also because of rumors that Lennon would be making a surprise appearance. Though the rumors turned out to be just that, John still honored Lennon by playing a cover of his signature solo song. Listen to Elton John cover “Imagine” on Sept. 13, 1980. Three months after John’s Central Park appearance, Lennon would be murdered by Mark David Chapman outside the Dakota. But his music never really left Central Park. 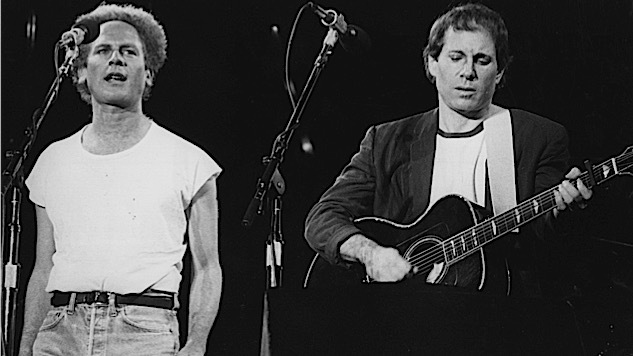 Three years later, Simon & Garfunkel followed in John’s footsteps by hosting a legendary free concert that drew some 500,000 people. Listen to them sing “The Late Great Johnny Ace” 36 years ago today, Sept. 18, 1981. The song pays tribute to three victims of guns: Lennon, President John F. Kennedy, who was fatally shot in 1963, and R&B singer Johnny Ace, who accidentally shot himself in 1954. Concerts in Central Park are now mostly the province of SummerStage, which lives across the park from Strawberry Fields, near Fifth Avenue. With shows by artists like Mavis Staples, George Clinton & Parliament Funkadelic and Yo La Tengo during this most recent summer season, the park remains a popular venue for live music more than three decades after John and Simon & Garfunkel drew their record-breaking crowds. One has to imagine that Lennon would be pleased to know that music—sometimes his own—is still bringing people together across the street from his house.